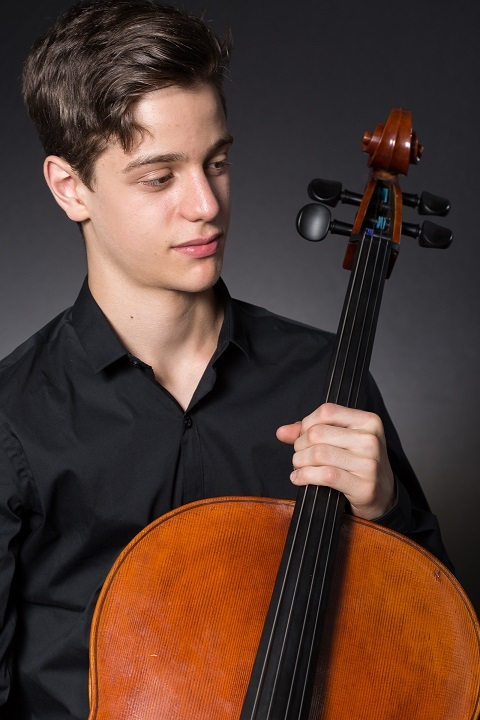 The Spectrum Symphony of New York is proud to announce a concert presenting the winner of its first annual Young Artist Concerto Competition (YACC), 13-year-old Noam Ginsparg, of Ithaca, NY. Ginsparg is the second-chair cellist with the Cayuga Chamber Youth Orchestra, and has served as a member of the Cornell University Chamber Orchestra, in addition to several other small groups. A student of Zachary Sweet and Dr. Madeline Shatz-Harris, Ginsparg has been the recipient of numerous awards for composition from the New York State School Music Association (NYSSMA) and the National Association for Music Education (NAfME). Currently, Ginsparg has his sights set on attending the Julliard School, and is attempting to make finals for the Johansen International Competition. Spectrum Symphony, a professional chamber orchestra devoted to the performance, encouragement and exposure of emerging orchestral composers, created the YACC to provide promising high-school-age musicians with the opportunity to perform with Spectrum’s orchestra. “Young artists hold the future of our culture in their hands,” said David A. Grunberg, Artistic Director of the Spectrum Symphony. “We feel fortunate to be able to support a young artist in this way.” Ginsparg and other finalists performed in live auditions in New York in September, 2017. The second and third place winners of the YACC are, respectively: 17-year-old Coco Mi, a violinist hailing from Princeton, NJ who attends the Manhattan School of Music Pre-College program; and 14-year-old Emma Su, a flutist from Ridgewood, NJ who attends The Julliard School Pre-College program. Ginsparg will return to New York on October 20 to perform Tchaikovsky’s Variations on a Rococo Theme, op. 33 with the Spectrum Symphony at the Broadway Presbyterian Church, his New York City debut. The performance will begin at 8 PM, and will also include the New York premiere of Nicolas Repetto’s Danse Diabolique for string orchestra, and Beethoven’s Symphony no. 8 in F, Op. 93. Tickets can be purchased at the following link, and will be available at a discounted price until October 10. Our artistic director, David A. Grunberg, has been invited to conduct two works by Samuel Barber, the Adagio for Strings and the Capricorn Concerto, for a benefit concert entitled “A Requiem for the Victims of Violence” to be held on October 1, 2017 at St. Philip Neri Catholic Church in Chicago, Father Thomas Belanger, Pastor. Mr. Grunberg will conduct the fifteen-member St. Philip Neri Chamber Players, Robert C. Fisher, Founder and Artistic Director. The Program will be hosted by Josef Micheal Carr, with Keynote address by Chris Kennedy. Special guest artist, Rachel Barton Pine, renowned concert violinist, will perform Summer from The Four Seasons by Antonio Vivaldi. Violinist/Conductor Terrence Gray will conduct George Walker’s Lyric for Strings on the program. Prodigies 11 year old Kene Obiaya (viola) and 15 year old Ifetayo Ali-Landing (cello) will also perform selected solos. Spectrum Symphony of New York will present a concert on Monday April 11 in New York City. The concert is a Centennial Celebration of Argentinian composer Alberto GINASTERA (4/11/1916-1983). Featured will be several works by GINASTERA: his Harp Concerto with internationally acclaimed harpist Mélanie GENIN; Variaciones Concertantes for orchestra; songs for soprano and piano with Ariadne GREIF, soprano; and piano works featuring soloist Tania STAVREVA. Also on the program will be the premiere of a new orchestral work by Guatemalan composer Sergio R. REYES, written especially for the occasion. The program will be conducted by artistic director David A. GRUNBERG. The concert will take place at 7:30 pm, April 11th, 2016, at Broadway Presbyterian Church, 601 W 114th St (on Broadway at 114th St), New York 10025. Alberto GINASTERA is widely considered to be one of the Americas’ most important 20th-century classical composers. Much of his work was inspired by the idea of the Gaucho, the legendary native horseman of Argentina. His work is divided roughly into three distinct periods: Objective nationalism (1930s to mid 1940s), Subjective nationalism (mid 1940s to late 1950s), and Neo-expressionism (late 1950s onward). This concert will feature works primarily from Ginastera’s middle period, in which he utilized elements of traditional Argentinian folk music combined with an increasing use of abstract compositional ideas. New York reviewers have described Spectrum Symphony’s concerts as “powerful, kinetic performance,” having “precision and enthusiastic fervor,” “determined focus,” and being “positively joyous”.